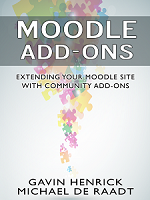 This week the latest version of Moodle was released, Moodle 2.6. This is a long-awaited version for many of the excellent features that have been added. There are new features for all – some which help students, some which teachers will love and some which administrators will dance over. Moodle HQ also released some videos highlighting each feature on their YouTube account. Resetting your password in Moodle is a cleaner 1 step process, where you request the change and the link sent enables you to change it on the page. The link expires after 30 mins for security reasons. The continued work on making the Moodle site work better on mobile devices is really paying off, with it working better on desktops, tablets and phones. The Skydrive integration is now available in core rather than a plugin, which is great news for institutions using it! The backing up and restoring of large courses has been improved performance wise which is great for all those 4-10 Gig courses out there! As this will be the version that most Northern hemisphere organisations implement next Summer, it is great to see so many great new features and continued improvements across the board. If you havent checked out the video playlist I am embedding it below. To download it – check the usual download page or GIT.